Club Penguin Cheats by Mimo777 Club Penguin Cheats by Mimo777: New Club Penguin System Defender Level? 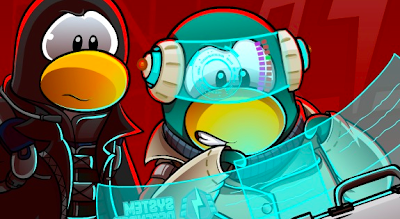 A new Club Penguin System Defender for secret agents was suppose to be released yesterday, but Billybob is now saying it will not be here until the end next week! Next week? Bummer! I guess that gives us time to practice our mad defending skillz! Well, that just stinks. For me, this new level and party are the best thingys in the whole month! And Mimo, do you know who we are going to figth then? Well, i do. Its Director. Im never going to comment your postes if im wrong :D What do you think, will it be Director? And if you beat him, you will know who he are. Aunt Arctic or Billybob, just like u said..
well, i knew this would hapen so a few days ago, when my freind asked "so whens that new system defender level you were talking about comming out". and so i told him it was comeing next week. Aw, c'mon! I already got mad defending skills! I beat all 5 System Defender levels yestreday without losing ONCE in a hour. Just remember guys, Club Penguin has a lot of other things to do than update a new mini-game. There could even be technical difficulties with the game. Who knows? I'd imagine running Club Penguin is not an easy thing to do, and it involves lots of teamwork :) Think on the upside - at least you know that the System Defender mini-game will come out eventually. Give them some time and everything will be sorted out.